"Science is now entering a new world order and may have changed forever. In this new world order, U.S. science will remain a leader but not in the unchallenged position of dominance it has held in the past. In the future, there will no longer be one major world center of science but multiple centers. As more scientists in countries such as China and India actively participate in research, the world of science is becoming globalized as a single world community. . . .Just because science is getting better in other countries, this does not mean that it’s getting worse in the United States. One can imagine U.S. science as a racecar driver, leading the pack and for the most part maintaining speed, but anxiously checking the rearview mirror as other cars gain in the background, terrified of being overtaken. Science, however, is not an auto race with a clear finish line, nor does it have only one winner. On the contrary, science has a long history as the collective enterprise of the entire human race. In most areas, scientists around the world have learned from U.S. scientists and vice versa. In some ways, U.S. science may have been too successful for its own good, as its advancements have improved the lives of people in other nations, some of which have become competitors for scientific dominance." 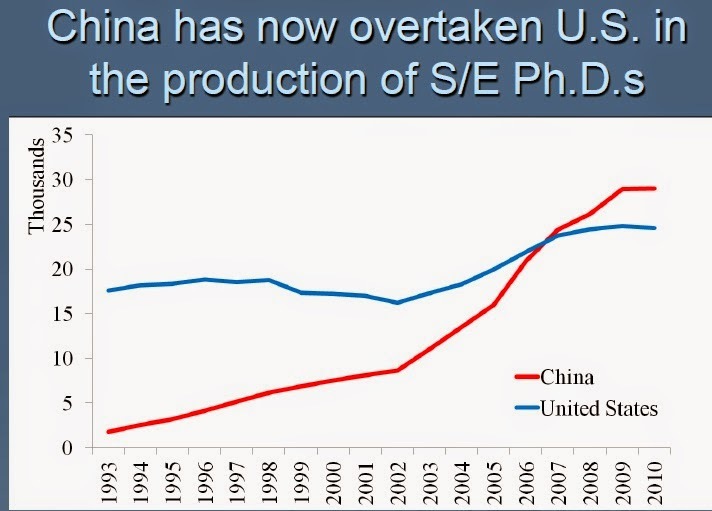 Here's the story of China's rise to global scientific prominence in four graphs. One way to measure scientific output is the number of research papers published. The U.S. still leads the world in this area, but its lead is eroding. 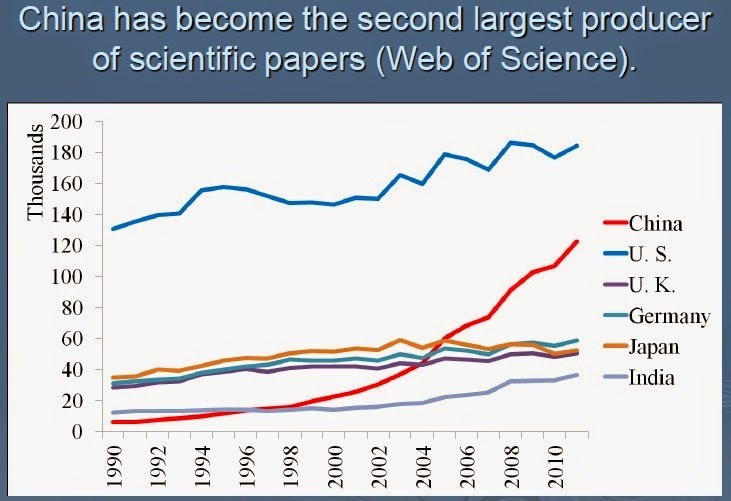 The sharp rise of China as a producer of scientific papers is clear (red line) but also notice the considerable rise in scientific papers from India (bottom light blue line). Perhaps these scientific papers from China tend to be on relatively unimportant subjects, while the really important work continues to be done in the United States? One way to measure this possibility is to look at how often papers from other countries are cited by other research. 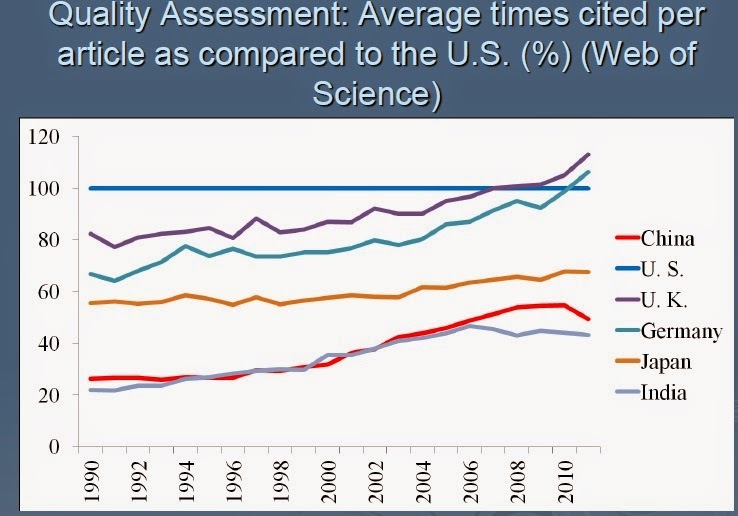 In the past, U.S. research was cited more than other countries, but that lead is also eroding. Scientific papers from the UK and Germany are now cited more often than similar papers from the US, and scientific papers from other countries, like China and India, have seen a rise in their citations relative to the U.S. level, too. Underlying these trends in scientific papers are the number of people trained in science. 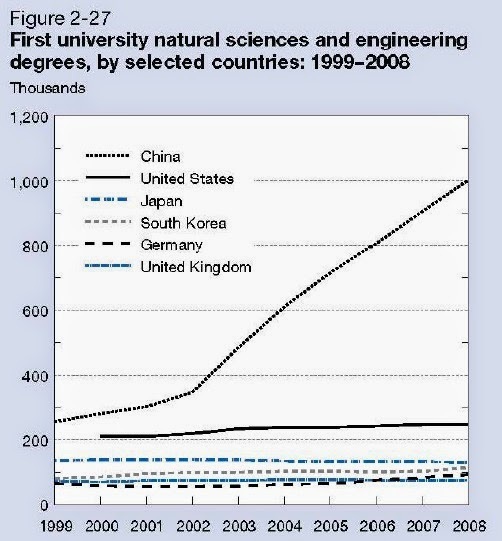 The number of undergraduates getting scientific degrees in China has skyrocketed, and the number of science and engineering Ph.D.s in China now exceeds that in the United States. One can raise a valid concern that the quality of education in China might not in all cases be up to U.S. levels, but the overall trends and patterns remain remarkable. Of course, part of what feeds these trends is just China's overall economic growth. One can argue, as Xie does, that it's not so much a matter of the U.S. science and engineering effort being lower, as a matter of rapid catch-up elsewhere in the world. Xie writes: "Census data show that the [U.S.] scientific labor force has increased steadily since the 1960s. In 1960, science and engineering constituted 1.3% of the total labor force of about 66 million. By 2007, it was 3.3% of a much larger labor force of about 146 million." Xie is also quite correct to note that science and prosperity should not be viewed as zero-sum games. [O]ur analysis of earnings using data from the U.S. decennial censuses revealed that scientists’ earnings have grown very slowly, falling further behind those of other high-status professionals such as doctors and lawyers. This unfavorable trend is particularly pronounced for scientists at the doctoral level. . . . [S]cientists who seek academic appointments now face greater challenges. Tenure-track positions are in short supply relative to the number of new scientists with doctoral training seeking such positions. As a result, more and more young scientists are now forced to take temporary postdoctoral appointments before finding permanent jobs. Job prospects are particularly poor in biomedical science . . .
At some deeper level, however, Xie's article doesn't quite come to grips with fundamental problem. Many people support public funding for scientific research because they believe that it will translate into a stronger U.S. economy, along with better-paying jobs and a rising standard of living over time. This argument as a strong historical foundation: that is, there are many examples in the U.S. and in other countries where scientist and industry interacted in this way. But in a globalizing economy, the linkage from science to the economy is less clear. If a new scientific discovery leads to a company with a U.S. headquarters and research lab, but production facilities someplace like Mexico, China, Indonesia, or South Africa, the economic payoff from that scientific discovery becomes less clear. Thus, while I would support a dramatic expansion of R&D efforts, I also believe that the U.S. needs to be rethinking the institutions and information pipelines that connect scientific discoveries, new and expanding companies, and a productive U.S. workforce. Free Parking: A Gift to Whom? Does Fair Trade Reduce Wages? Does Foreign Aid Prolong Civil Conflicts? Is the World Already Growing Sufficient Food?